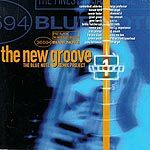 CD review: "The New Groove"
This review first appeared in the Summer, 1996 issue of THE BRIDGE Illustrated. See, the suits at Blue Note got tired of their old stuff being copped by the young rappers. They paid serious coin for the rights to recordings by old-school jazz cats like Nat Adderley and Horace Silver, and when some young dj rapper lays down tracks including samples from the old stuff and they don't get a piece of the action  well, you don't get to be a suit by being a nice guy. And just as Woodstock quickly got co-opted by the corporate types with films and soundtracks and all, and just as the Internet is quickly being taken over by Coca-Cola and Disney, so the suits at Capitol (which owns Blue Note) figured they better get a piece of the hip-hop action if they wanted to get their cut. The offered some of the top hip-hop artists access to the original jazz recordings  no more worn-out LPs!  if they'd do the deal on Blue Note. And so young lions like Easy Mo Bee, Diamond D and DJ Smash take classic jazz cuts like "Listen Here" by Eddie Harris and "The Sophisticated Hippie" by Horace Silver and turn 'em inside out. Forget the money-grubbing reason for the recording; the thing is it works. So check it out  it's the new sound, hip-hop and jazz, rap and bop, funk and phreak, War meets Miles, Basie meets Basia. The beat, the solos, the past, the now. It's all here, wrapped up in a hypnotic groove.